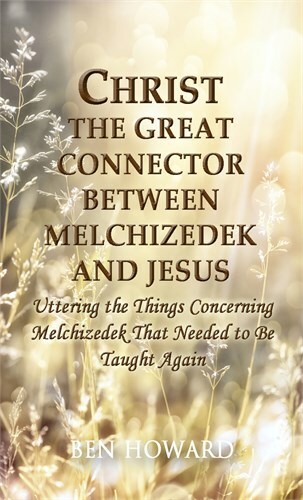 Here within this book, Christ the Great Connector Between Melchizedek and Jesus, we can see that God is showing us, through Melchizedek, His plan hundreds of years before it came into being. This was God in the Old Testament using the anointing that later became known as the Christ which came into His Son Jesus at His baptism by John. We see God bearing witness to this event in Matthew, Chapter 3. And in the Book of Hebrews, Paul took this truth and by the inspiration of God went deeper into this revelation. All of this we will learn from what Paul wrote for us in the Book of Hebrews. He shows us a very important truth about how Christ, through Melchizedek, overcame death. After this, Melchizedek is seen no more; showing that he was not a permanent living soul, but was a prototype of Jesus the Christ. So this finished the purpose of Melchizedek being here on earth. It was the Christ that was permanent, which is seen again in Jesus, thus making Him the Lord Jesus Christ. These are important facts to keep in mind as we begin to unravel this great mystery.